Stereotypies in animals are thought to arise from an interaction between genetic predisposition and sub-optimal housing conditions. In domestic horses, a well-studied stereotypy is crib-biting, an abnormal behaviour that appears to help individuals to cope with stressful situations. 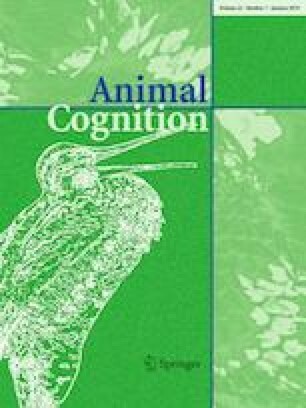 One prominent hypothesis states that animals affected by stereotypies are cognitively less flexible compared to healthy controls, due to sensitization of a specific brain area, the basal ganglia. The aim of this study was to test this hypothesis in crib-biting and healthy controls, using a cognitive task, reversal learning, which has been used as a diagnostic for basal ganglia dysfunction. The procedure consisted of exposing subjects to four learning tasks; first and second acquisition, and their reversals. For each task, we measured the number of trials to reach criterion and heart rate and heart-rate variability. Importantly, we did not try to prevent crib-biters from executing their stereotypic behaviour. We found that the first reversal learning task required the largest number of trials, confirming its challenging nature. Interestingly, the second reversal learning task required significantly fewer trials to reach criterion, suggesting generalisation learning. However, we did not find any performance differences across groups; both stereotypic and control animals required a similar numbers of trials and did not differ in their physiological responses. Our results thus challenge the widely held belief that crib-biting horses, and stereotypic animals more generally, are cognitively impaired. We conclude that cognitive underperformance may occur in stereotypic horses if they are prevented from crib-biting to cope with experienced stress. We are grateful to all the owners of the horses who offered to participate in this study. We are also grateful to Matthew Parker, who gave us the idea to perform this study and helped us with the design of the experiment. The experimental procedure for the horses was approved by the Federal Veterinary Office (approval number VD 26777 bis; Switzerland).